Dental bridges are one of the many services offered by Dr. Paulo Viana and his associates. When you are missing a tooth, a bridge is one of the many options available to remedy the situation. A dental bridge is an artificial tooth, attached to adjacent teeth. It is cosmetically pleasing and acts to maintain the space that was held by the natural tooth. Crowns are placed on the teeth adjacent to the missing tooth to increase their strength and prepare those natural teeth for the bridge. The bridge will then be created and attached to the crowned teeth. The finished result looks natural and allows you to restore your bite as well as your confidence. Contact us today to schedule a consultation with Dr. Viana to determine if a dental bridge is right for you. We have two offices: Viana Family Dental Centre in Komoka and Dr. Paulo Viana and Associates in London. Dentures work by replacing missing teeth and gum tissue. They come in full or partial dentures and may be placed in upper or lower jaw. Partial dentures are used to replace one or a few missing teeth. 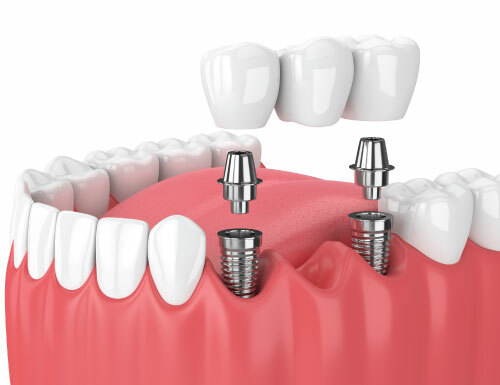 They are either supporter by precision attachments fitted onto crowns or clasps around existing teeth. They come with a gum-colored acrylic base which adds support to the denture. In some cases, they come with a metal framework for added support and strength.